Could you be a Future or Senior Leader? Giving our talented people opportunities to build the skills and experience they need to become future leaders is one of my top priorities. These changes won’t happen overnight - we must build a strong and diverse pipeline for future DG and Permanent Secretary roles - individuals who can compete with the best from the private sector. I’m a strong believer that nothing should stand in the way of talent rising to the top, and in creating the mechanisms to allow that to happen. That’s why I’m writing this blog to encourage you all to find out more about the Civil Service Talent Schemes available. In particular, the Future Leaders Scheme (FLS, for Grades 6/7) and the Senior Leaders Scheme (SLS, for SCS1) schemes are fundamental to this ambition. That’s why we are expanding the FLS intake to 150 places this year, with a further 50 places on SLS. You can apply for these through the Civil Service Learning site. These schemes are designed to give civil servants who show high potential targeted development in areas such as leadership, commercial knowledge, and project management, so that they can get experience and insight into the skills they will need to become the leaders of the future. Most importantly, they offer participants the opportunity to share and learn from experiences with colleagues from across different departments. The future depends upon a more collaborative working style, so we can optimise how to deliver public services most efficiently. So the chance to build networks with peers across the Civil Service is invaluable. This emphasis on different skills and experience at the top is central to the wider ambition on diversity. It’s easy to dismiss these schemes as something that ‘other people’ get onto - that you have to be Whitehall-based, or a from a certain background, or work in a certain team, to apply. In fact, there are already people on these schemes representing many parts of the Civil Service - from professional career paths like commercial, digital and project management, and from organisations across the whole Civil Service, spanning Great Britain and Northern Ireland. And this year for the first time, anyone can complete an online self-assessment, rather than being nominated by their departments. So I’d encourage anyone to apply who thinks they have the potential and talent to succeed - regardless of what they do or where they’re based! These schemes form a cross-Government initiative for talented Grade 6/7s (FLS) and deputy directors (SCS Pay Band 1) (SLS). Scheme participants should have the potential and aspiration to move into the most senior roles in the Civil Service, e.g Director General or Permanent Secretary. Selection for the FLS and SLS 2015/16 intake is open now, via https://civilservicelearning.civilservice.gov.uk/High-Potential. Applications must be submitted by 9am on 23rd June. Can Fast Streamers join the FLS? Thanks for the comment. Unfortunately FLS and SLS aren't open to fast streamers. FLS is for substantive G7/G6 and SLS is for substantive deputy directors (SCS1). Best wishes, CS Talent. This is all well and good, but the majority of staff within the civil service are below grade 7, and therefore a higher number of applicants received for progression. Development scheme opportunities at, for example, SEO grade are limited, if existent at all. Thanks for the comment. I'm obviously not sure which bit of the civil service you work in, but many departments have development schemes for people below grade 7. I appreciate that might not be the case where you work. You might want to look at the Positive Action Pathway, offered by CS Learning: https://civilservicelearning.civilservice.gov.uk/pap. This programme is cross-Government and is designed for Grades AA all the way to G7/G6; focussed on those from under-represented groups. But perhaps speaking to your local HR team or Trade Union might be a good place to start. I hope that helps. I'm currently on the Future Leaders scheme and would really recommend it if people are thinking of applying. One of the major benefits is coming together and sharing learning across the civil service. I think it is really important that we then share that learning more widely within our Departments. Thanks for your comment Elizabeth and glad that you've recommended the scheme. 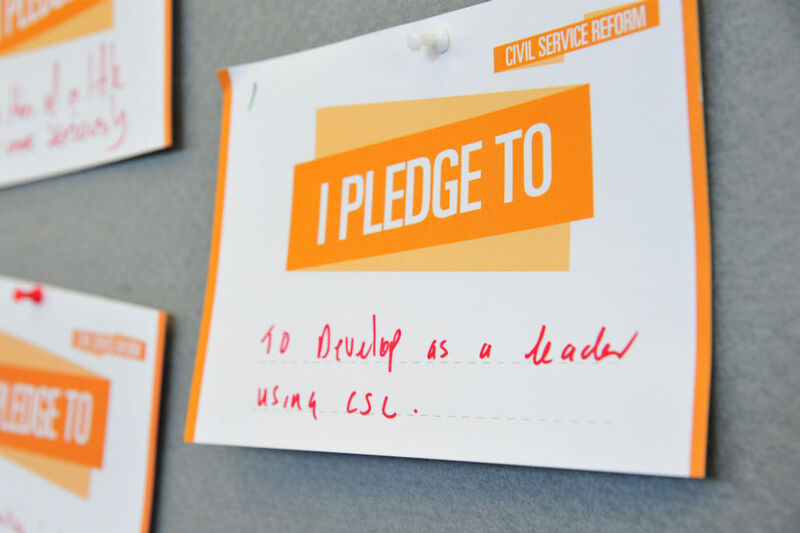 I participated in the FLS last year and got a lot out of it - both in terms of networking and getting a better understanding of the key challenges in the civil service. I would really recommend applying. I am now in the SCS and that is in part due to the support of the scheme and the confidence it gave me. I now have a coach as a result of my participation and find this really valuable. Thanks for your comment Emily and glad that you've recommended the scheme. The FLS is brilliant at helping you to think about what it means to be a leader and to develop your own leadership skills. As others have said, it is also great in giving confidence and broadening out your network right across Whitehall, particularly with senior staff as well as your own peers. If you get the chance, then definitely go for it! Will those who have applied for the scheme be notified today if they are successful? I have a disabled child which means I need some (not a lot) flexibility with work and also to remain based at my current location - would this exclude me from progressing on this scheme?